Pork Binagoongan is a Filipino specialty made from Pork and Shrimp Paste. 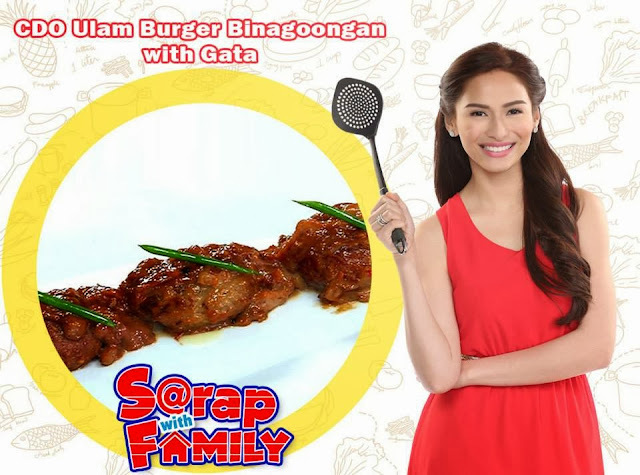 But this time, we are using CDO ulam burger instead of pork and made it more flavorful with Gata. This is a must try recipe! 1. Heat pan and oil then sauté onion, garlic, tomatoes and siling labuyo until softened then add in bagoong cook for 3 minutes then add in CDO Ulam Burger and cook until lightly brown. 2. Pour in vinegar and cook for 5 minutes then add in sugar and gata. 3. Cook until thicken. Serve with cooked rice. Hosted by Jennelyn Mercado, Sarap with Family is your daily serving of dishes that bring the family closer together. Mas saSARAP na ang FAMILY bonding with Quick and Easy recipes mula sa CDO!